Amazon’s annual Prime Day is coming on Monday next week (7/16), and it’s slated to be yet another massive, global phenomenon. Pretty impressive for new holiday. Since Foursquare uniquely has a pulse on how people move through the world and how these data points emerge as behavioral patterns, we decided to take a look at how people shopped in the weeks around Prime Day last year. The results? Pretty eye-popping. 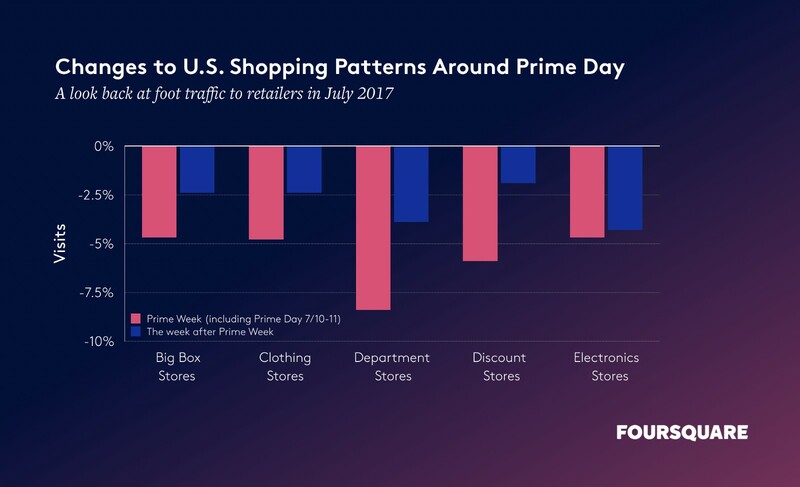 While more than 90% of shopping still happens in the real world, the week of Prime Day 2017 was the lowest foot-traffic week for retail stores for the entire summer. We found some more interesting patterns when we separated out the week of Prime Day and after, and made a distinction between major retail categories. Methodology: To analyze foot traffic patterns, Foursquare looked at visits via Foursquare City Guide and Swarm app users plus partner apps during the week of Prime Day 2017 (July 10–16, 2017) versus the following week (July 17–23, 2017), both compared to an average of the 8 surrounding weeks, excluding July 4th week. All data was pseudonymized, analyzed in the aggregate, and normalized against U.S. census data to remove any age, gender or geographical bias. We’ll be watching to see how Prime Day affects shopping in 2018, but if we were to hypothesize, we’d guess that Amazon continues to be successful at driving shoppers online. Deep discounts and convenience seem to beat out brand loyalty and experiential shopping—and thus, Prime Day does the job. Visit us at enterprise.foursquare.com or email ads@foursquare.com to learn more about how to reach and convert shoppers who visit departments stores and other retail categories; to measure the impact of digital advertising on both online and offline shopping; and to uncover rich consumer insights and thoughtful marketing strategies informed by location technology. @Foursquare dir. of comms + editor-at-large. @TravelLeisure, @LouHammondPR, @SyracuseU alum. Bed-Stuy based and loving it.